A light-weight, human-size and low-cost developing humanoid robot is developed . The humanoid robot is named Saika (``outstanding intelligence'' in Japanese). 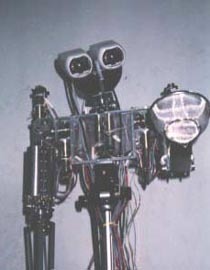 The developed humanoid robot Saika has a two-DOF neck, dual five-DOF upper arms, a torso and a head. Several types of hands and forearms are developed. They are chosen depending upon the tasks to perform. most of the motors are installed inside the arms and the torso. catching a thrown ball [4,5,7]. Koichi Nishiwaki, Takuro Noda, Masayuki Inaba and Hirochika Inoue. 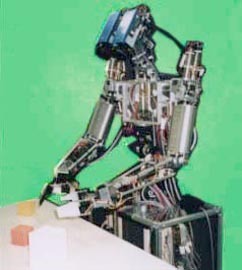 Development of a Humanoid Robot Saika. Study on learning of a robot arm's movement based on visual information. Study on the grasping unknown objects using multi-fingered robot hand. Study on the catch a ball behavior using a humanoid. M. Inaba and H. Inoue. Dexterous Manipulations of Humanoid Robot Saika. A. Konno, M. Tada, K. Nagashima, M. Inaba and H. Inoue. Development of a 3-Fingered Hand and Grasping Unknown Objects by Groping. Masayuki INABA and Hirochika INOUE. The Humanoid Saika that Catches a Thrown Ball. Atsushi Konno, Masayuki Inaba and Hirochika Inoue. Interaction between Human and Humanoid Robot Head "Chiye." Kayama, K. and Nagashima, K. and Konno, A. and Inaba, M. and Inoue, H.